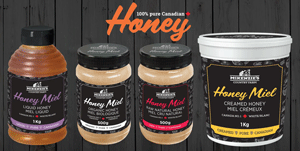 Golden Acres Honey/McKenzie Country Farm Honey has gained a reputation for producing some of Canada's finest honey. Our natural and healthy products combined with personal, friendly service and integrity ensure customer satisfaction, which is key to our continued success. In addition to our own brands we also offer private labelling services. We are able to offers a wide variety of containers, ranging from 500-gram plastic and glass containers to 290 kilogram barrels.